When tree removal is necessary on campus, one of the best ways to use the wood is to make it into something new. Under Grounds Management’s wing, campus trees take on new life through the salvage wood program. Steve Valentine, a carpenter with Facilities Services, operates the new CSF-funded lumber mill in Seattle, Wash. on March 1, 2016. The salvage wood program is run by the Facilities Services Grounds Management. The program uses wood from all across campus to create finished products, such as benches and tables. Essentially, the wood is being reused instead of turned into compost or made into wood chips for campus garden beds. The entire program is a collaboration between the Facilities Services carpenters and the local projects team of the UW chapter of Engineers Without Borders. A majority of the wood that gets funneled into the salvage wood program comes from construction projects, trees that pass from natural death, diseased trees, and potentially hazardous trees that need to be removed. Before the salvage wood program began, trees that needed to be removed by Sara Shores, the campus arborist, were cut into chunks and put into a compost pile. Now, the wood is diverted and made into something with new life. Grounds Management is beginning to stockpile wood for future projects. Shores said Ed McKinley, the Shop 54 finish carpentry lead, was invested in starting the program, but the sawmill used to cut the wood was too expensive to immediately purchase. When new project ideas were brought up – such as making a bench or a conference room table – McKinley originally sawed everything by hand. “Ed was really invested in the project, and kept pushing for it,” said Shores. The salvage wood program came to fruition from a variety of projects. According to Shores, the desire for a salvage wood program began with an elm tree in front of Gerberding. The tree needed to be taken down, and Grounds Management didn’t want the wood to go to waste. Grounds Management received an offer from Urban Hardwoods, a local reclaimed wood furniture store, to store the wood to dry for two years. McKinley said the program developed when a community member came to Shores about making a log bench for a local restoration project. McKinley said Shores asked if he could cut a log in half, but McKinley didn’t have the proper equipment. Eventually, McKinley purchased a chainsaw attachment to eventually cut the logs in half. 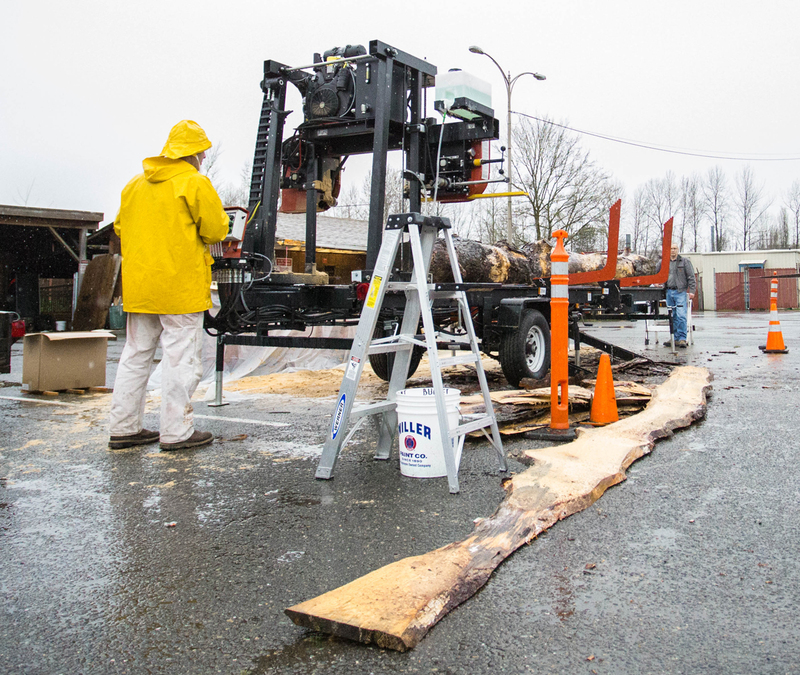 “[The salvage wood program] made the job more interesting and fun,” said Shores. The Grounds Management team prepares to cut a Ponderosa Pine for their salvage wood program in Seattle, Wash. on March 1, 2016. Trees that are removed from campus will be used to make new materials, such as tables and benches, for the University. The north campus student housing project will be a huge wood supplier for the salvage wood program. The project requires dozens of trees to be removed from the area surrounding McCarty Hall. McKinley and Shores said it is likely that 60 percent of the trees are likely going to the salvage wood program. “At the University of Washington Seattle campus, we’ve established a one-to-one tree replacement policy for all trees removed for construction. The [north campus housing project] is actually exceeding that, because we have the area to do it and the intent is to recreate the wooded environment characteristic of this part of campus,” said Kristine Kenney, the university landscape architect from the Office of Planning and Management. Around McCarty Hall, there are 87 trees being cut down. Each tree will produce somewhere between one to four logs depending on the height of the tree. The remaining wood waste goes to Cedar Grove, an environmental solutions company, to be used for mulch. The project has used a variety of wood from around campus. Years ago, the Hec Ed Pavilion used to pack people onto wooden bleachers to watch the games. The bleachers were eventually removed to be replaced by aluminum bleachers. In the end, the Grounds team ended up with the bleachers. They are planning on using the material to make windows, conference tables, and other products for campus. 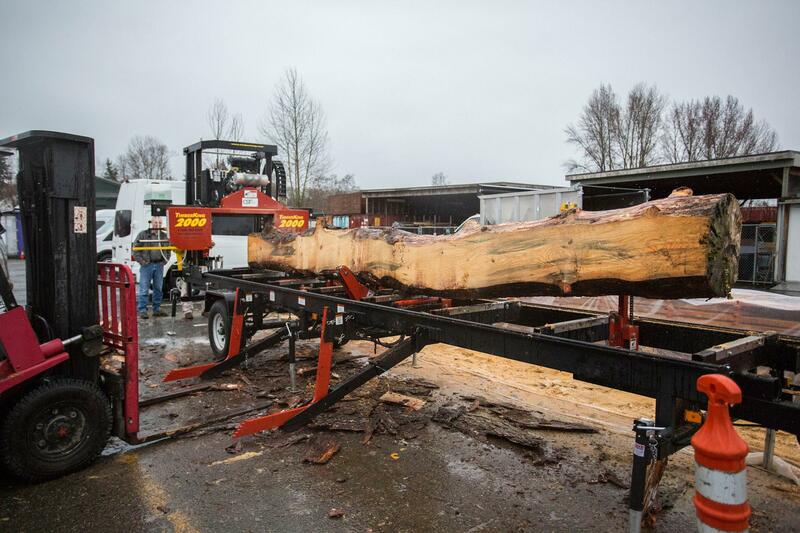 A Ponderosa Pine is cut for the salvage wood program in Seattle, Wash. on March 1, 2016. The program is just now getting started. 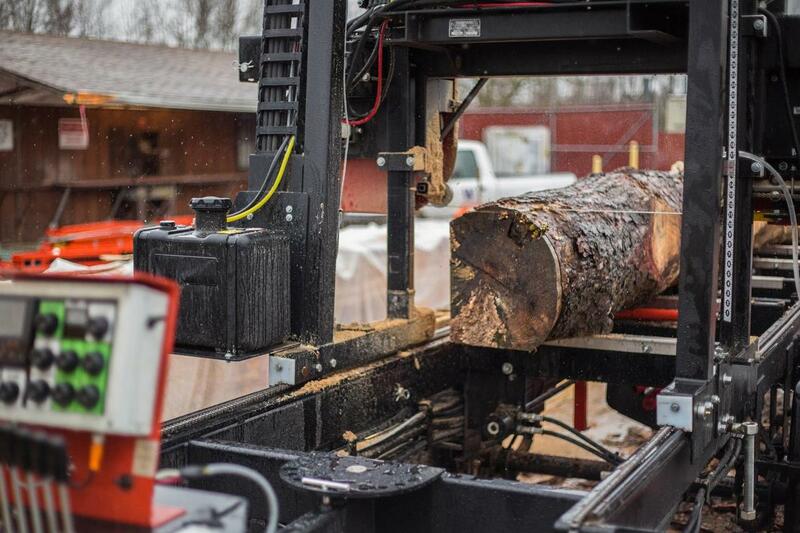 “[The salvage wood program] is still in its infancy. I’m not exactly sure how it’s going to work, but we’re going to make it work,” McKinley said. During the 2014-2015 school year, Grounds Management applied for a Campus Sustainability Fund grant for the program. They ended up receiving more than $40,000 to fund the program. The sawmill for the program just arrived in February 2016, and the Grounds carpentry shop began training for the machine almost immediately. But with every new project comes a new learning curve. Grounds Management has also been working with UW Engineers Without Borders on the project. McKinley and Daniel Sorensen, the sustainability coordinator for Grounds Management, have been collaborating to design a solar kiln to dry the wood before milling. “If you release the moisture slowly, it has a low chance of damaging the lumber,” McKinley said. Ideally, the solar kiln will be constructed sometime in April. Noah Johnson, a student who volunteers with UW Engineers Without Borders, started getting involved with the solar kiln project in autumn 2015. Some of the group coincidentally met Sorensen at a nearby volunteer work day. UW EWB needed a local project, so Sorensen suggested UW EWB partner up for the solar kiln. “When looking for a project we wanted something nearby that would make travelling and communication relatively easy, a small to medium scale project, and something that would offer the team both design and construction experience,” Johnson said. Johnson and the rest of the team work with several mentors that help out with the solar kiln design process. Scott Douglas, one of the mentors, looked over their initial designs and reviewed their first round of changes. Now the students meet up once or twice a quarter with Sorensen and McKinley. At their meetings, they discuss insulation options, the proper angle of the solar panels, and the framework for ventilation controls. Sorensen is also working to coordinate outreach efforts to the campus community who may be interested in participating in the project, such as the College of Built Environments and projects related to Capital Planning and Management and Facilities Construction projects. Sorensen is additionally working on a way to measure and quantify how much wood is being used as part of the program. 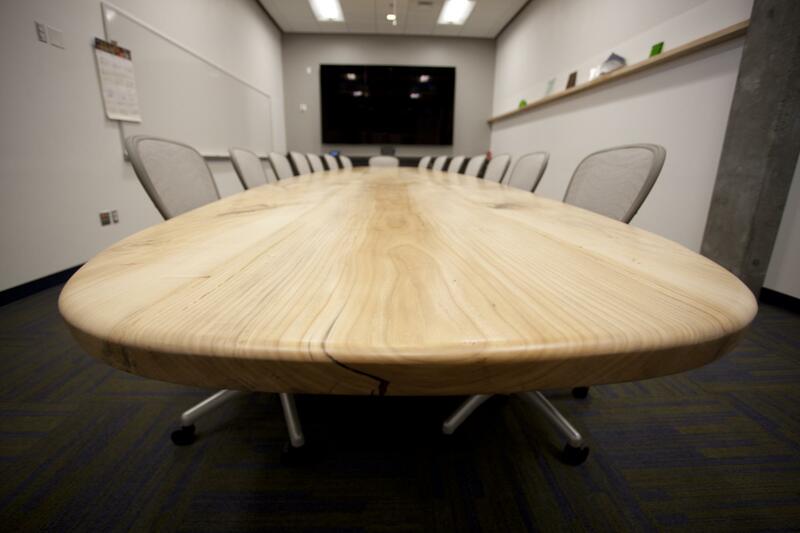 In 2013, Shop 54 received a Husky Green Award for their work on the elm tree table in the Facilities Services Training Center Conference Room.